That’s it. That’s everything you need on a sponsorship form to help you raise money for a worthy cause. Why Do You Need Sponsorship Forms? A sponsorship form is essential when holding a charity event or participating in one. It’s a good way of collating donations and keeping track of who’s pledged money to support. If you’re hosting a charity event, like a sponsored 5K run, then you should provide runners with these forms months in advance. Forms need to be sent to participants long before the event takes place. This gives attendees as much time as possible to speak to family members, friends and work colleagues to ask them for donations. What Should You Include on a Sponsorship Form? Here’s a more relaxed-paced guide to what you should include when creating a sponsorship form. In many cases, participants will post forms in workplace kitchens or classrooms (if they’re teachers or still at school) - anywhere there might be a high volume of traffic. This increases the chances of receiving donations as more people are likely to see the form. Because of this, the form needs to include all of the necessary information as the participant might not be on hand to offer extra information. Firstly, you should include information about yourself. Who you are, the event you’re participating in and the charity you’re raising money for. The more you write about the charity and the great work they do, the more likely someone is to donate. Create a large table for donators to use to enter their details. Name is an obvious first header. You need to know who each donation belongs to. Donators should write their address, but it’s only actually required if they tick Gift Aid. The date is a good way of keeping track of when each person pledged to donate for future reference. The date pledged and the date paid columns help you to know who still needs chasing for their donations after the event is completed. Most importantly, include a column for people to enter how much they’d like to donate. There’s no right or wrong figure, but it could be worth including a suggested number or details of what their money could do for the charity. For example, “£2 provides two malaria nets” and so on. Finally, give donators the chance to tick if they’d like to allow Gift Aid. This enables the charity to claim back the tax already paid on a donation, adding 25p to every £1 donated. 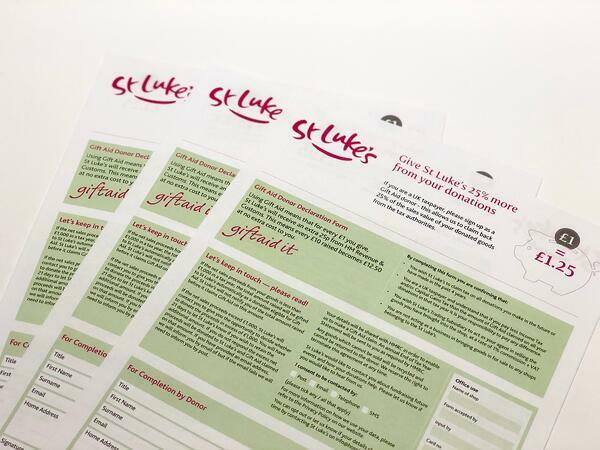 There’s no extra cost the donor, but they need to make sure they include their full name, home address and postcode on the form for Gift Aid to be successful. It’s important you include all terms and conditions regarding Gift Aid so that anyone considering it knows exactly what they’re agreeing to. If you’re hosting a charity fun run, then you can just send a sponsorship form in response to each person’s application. But if the event is larger than a fun run and people don’t need to apply to get involved, how exactly should you distribute forms? A download link on your website or social media gives participants the chance to print out a form at home. Just create the form online and once it’s ready, provide a link for users to access and download it. Not everyone has access to a printer or is likely to know where to go to download the form. Because of this, it’s also important to offer the form as a print copy, usually as part of a newsletter or event brochure pack. Anyone who wants to get involved in your charity event can sign up to receive a sponsorship pack or newsletter and the form can be attached. Newsletters are great ways of encouraging someone to participate. Maybe they’ve been involved in the past and been signed up ever since, or they’ve expressed an interest in your charity online. Either way, a newsletter can be the nudge someone needs to dust off their running shoes or baking apron. There’s a lot to remember when creating a charity newsletter. The content needs to be checked for mistakes, the images need to be the perfect quality and if you’re sending a sponsorship form, it needs to include everything a participant will need to collect donations. Lucky for you, we’ve put together a handy checklist that you can use when creating a charity newsletter. Tick off each stage of the process and create a newsletter that’s perfect and on time.